I taught a class this week featuring a few of my favorite summer fruit desserts. One of the desserts was an Apricot Custard Tart with Almonds. This tart has been in my repertoire for years, but it had been a while since I made it. I had forgotten how good it is. Soft, creamy custard, perfumed with almond and punctuated with the bright tang of apricot...it really is an excellent summer tart. I returned home from my class wanting another piece. So, the next day I made a point to go to the store to pick up some apricots. Unfortunately, the apricots at my grocery store didn't look so great. But right next to the apricots there was a big bin of beautiful "Black Velvet Apricots". 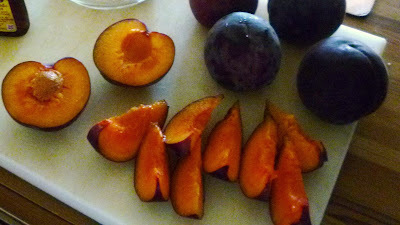 If you have never come across this kind of apricot before, they look pretty much like what you would imagine upon hearing the name: the skin is a purple-y black with the velvet feel of an apricot. Since they looked so nice, I thought I would give them a try in the tart. When you read through the recipe, you will notice something a bit unusual for a pastry recipe. For a couple of the ingredients, the quantity is given as a range rather than a definite amount. This is because the amount of custard is too much for a 9-inch tart—but half a recipe would not be enough. The quantity is actually a better fit for a 10 1/2-inch tart pan...but most people don't have this size (9-inch is the standard size called for in most recipes). So the smaller amounts listed for the fruit and almonds are for a 9-inch tart and the larger amounts are for a 10 1/2-inch (you should have more than enough custard for either size). No matter what size you choose to make, you should be aware that the amount of fruit called for in the recipe is really only a guideline anyway. You may pack the fruit into the shell as tightly or as sparsely as you like—depending on what kind of ratio of custard to fruit you prefer. Any custard that you have left after building your tart can be used to make a little cook's treat: Fill a buttered ramekin or shallow gratin with a layer of fruit (any berry or stone fruit will work) and pour the custard over. Bake in a 375° oven until puffed, golden and set. Cool slightly, dredge with powdered sugar and enjoy. When I got home with my Black Velvet Apricots and cut in to one, I realized that what I was looking at was actually a cross between an apricot and a plum. There are many such crosses on the market...plumcot, aprium, pluot...usually the name reveals that it's a cross. I suppose I should have guessed that this was a cross with a plum just by looking at the color of the skin, but I didn't. The first thing that gave away the Black Velvet Apricot's lineage was the pit. It looked much more like the pit of a plum than an apricot—although it was not as tightly attached to the flesh as it usually is in a plum (one of the nice things about apricots is how easy the pit is to remove). The next thing I noticed was the flesh. Although deep orange like an apricot, it had the slightly translucent quality of a plum. I tasted one. It was quite juicy with sweet flesh and tart skin...just like a plum. I have never made this particular tart with plums, so I wasn't sure how it would work. Apricots have a drier flesh than plums and I was concerned this apricot-plum cross might be a bit juicier than the custard could handle. Over the years I have made this tart with fruits other than apricots. I have found that it works well with Bing Cherries and with Berries (I posted a version made with raspberries and red currants from the St. Paul farmers' market a couple of years ago). So, since the custard and crust were ready to go....and I really wanted to eat a slice of apricot custard tart...I decided to go ahead and give it a try. The Black Velvet Apricots made a beautiful tart. Just like plums, their skins turn a jewel tone purple when they cook, so the tart underneath the almond topping is a pretty mosaic of purple, cream and apricot. It tasted good too. But, just as I suspected, the Black Velvet Apricots released a bit more juice during the cooking process than a plain apricot would, making for a much softer and more delicate tart. If I had my choice, I would always make this tart with traditional apricots. But, if Black Velvet were the only ones available, I would use them again. Either way, this is a delicious summer fruit tart. ﻿In a small bowl, whisk the eggs with the sugar. Whisk in the flour. Add the cream and the almond extract and whisk until smooth. Set aside. Arrange the apricots in concentric circles in the pre-baked tart shell. Carefully pour the custard over, jiggling the pan a bit to help distribute the custard. You may not need all of the custard—there should be just under a quarter inch of space between the top of the custard and the rim of the shell. Scatter the almonds over the surface of the tart. Place the tart on a baking sheet and bake at 375° until custard is puffed and the tart is golden—about 30 to 40 minutes. Briefly cream the butter and sugar together until smooth. Beat in the egg yolk and the vanilla. Add the flours and mix until well combined. Form the dough into a thick disk. Use immediately, or wrap in plastic and chill or freeze. Let the dough soften before rolling out. On a lightly floured board (or between 2 sheets of plastic wrap), roll dough out to a thickness of 1/8- to 3/16-inch Brush off the excess flour and transfer the dough to a greased tart pan. Ease the dough into the pan being careful not to stretch it and pressing it against the sides of the tart pan. Use your hands or the rolling pin to gently cut the dough flush with the upper rim of the tart pan. Note: This amount of dough is enough for 1 1/2 9-inch tart pans. I generally make up a double batch and divide it into 3 disks of dough. Freeze the disks that you don’t need. Use within 3 to 4 months. Wow! This looks wonderful, Paige. I'll have to try it. This is simply beautiful! its a work of art that I'm sure tasted amazing! This may be the finest fruit desert recipe I have ever tasted. I'm trying it today with blueberries. I love your blog...you are a true inspiration. THANK YOU! This may be the finest fruit desert recipe I have ever made! I am trying it today with blueberries. I added a 1/4 Cup of melted apricot jam to coat the almonds on top last time...worked out terrifically. THANK YOU so much for your blog...you are a true inspiration!! Thank you so much for telling me of your success with this tart! Blueberries will be wonderful. And I love it that you brushed the top with melted apricot jam...a great finishing trick!